Opens and clears the chakra, purges and releases negative emotions from the Hara line and one's life purpose. Clears the emotional body of past-life and this-life traumas and negative emotional patterns. It acts as a protector while going through this detoxifying experience and offers aura insulation, safety and trust as it clears the negative influences. 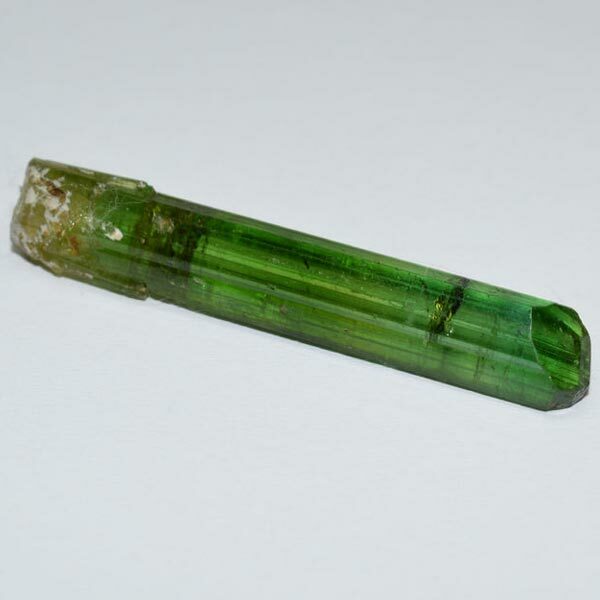 Green Tourmaline has a Trigonal crystal system and is formed in a primary manner. When formed magmatically it grows freely. When neighboring rock is influenced by gases in the magma that contain boron it can come into being as a pneumatic displacement (when one element trades places with another element in a compound). When this occurs, the crystals are found firmly embedded in the rock. Green Tourmaline (also known as Verdelite) gains its beautiful shades from the addition of chromium and aluminum during its formation. Whatever color, all tourmaline has the same base structure, it's the addition of certain metals that provide the beautiful coloring to the individual types. This stone is deep-acting and can sometimes cause intense releases. It is best to work into wearing it in hour segments and gradually increasing. Men may eventually work towards wearing it 24/7 because of its masculine energies without any problems. Women, however, will want to work up to only about 12 hours on and 12 hours off. This is due to the differences in our real physical make up. Green Tourmaline provides 'joie de vivre' and can make us grateful for the wonders of life. It is of great assistance to help quiet the mind when used as an aid in meditation or visualization, allowing the opening of new areas of awareness. It also helps to connect the heart with the third eye, fostering a deep experience of unity with universal creation. Green Tourmaline provides us patience and helps us to keep an open mind. It encourages us to have interest in our fellow human beings. Green Tourmaline helps us to see a number of possible solutions in any situation and allows us to choose the best one according to our knowledge and conscience. Green Tourmaline regulates blood pressure and can strengthen the heart and nervous system. It encourages elimination, even at a cellular level, and aids in diarrea or constipation. It also helps to clear the blood and lymph glands from toxins. Once cleared, it will stimulate digestion and strengthen the immune system. It benefits first the physical, then the emotional and finally the mental part of one's being. It will do this by working in rounds and will tackle only one problem at a time. Green Tourmaline has a special affinity with Leo and Capricorn. Its Energy is Receptive, its planet is Venus, and its Element is Earth. It is a favorite of artists as it is a good creative stimulator, and for healers who primarily work with herbs. This stone has been used to draw money and success in business. You would place one in a piggy bank or coin purse for the best results. While it was probably known in antiquity it was equated with other gem types because of its coloring. During the 18th century it became known as the 'stone of wisdom - clear and resistant to all vagaries of fate' (Bernardus Caesius).